With JD(S) reluctant on settling for 10 seats and keeping its focus on southern Karnataka, sitting MPs Veerappa Moily and KH Muniyappa seem worried as the party may give these seats to the JD(S). While Moily represents Chikkaballapura Lok Sabha seat, Muniyappa is a Kolar MP. Bengaluru: As JD(S) leaders stick to one-by-three formula for seat sharing with Congress in Karnataka for Lok Sabha elections, Congress leaders KH Muniyappa and Veerappa Moily seem worried. According to sources, JD(S) has asked Congress to give ten seats including Chikkaballapura, Kolar and Tumakuru. In 2014 HD Kumaraswamy contested against sitting MP Moily from Chikkaballapur as the constituency comprises over 40% of Vokkaligas and SC and ST community, which are also a deciding factor. 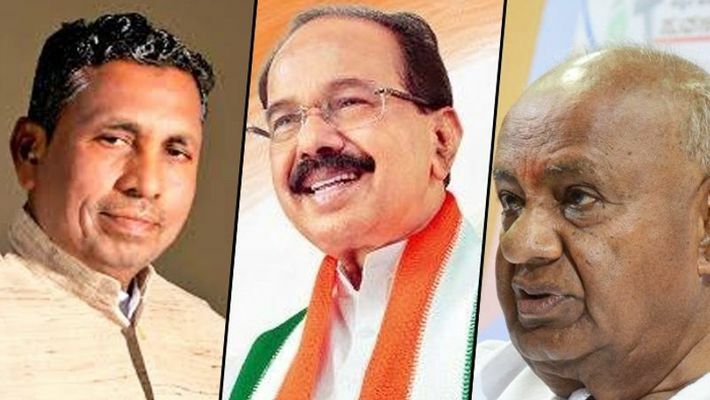 There were rumors about Nikhil Kumaraswamy being launched from here earlier and it is at that time Moily attacked BJP saying that the chief minister’s chair is not vacant, indicating fear that JD(S) may ask this seat. Similarly, Kolar being a SC-reserved seat, the party's JD(S) and Congress feel their candidate may get lucky. Muslims, SCs and Christians are the deciding factor here. JD(S) may also ask Congress to give the Kolar seat. When asked about the possibility, sitting MP KH Muniyappa said that he is confident of securing the seat. "I will get the seat. The talks are still on between the JD(S) and the Congress high-command. As far as I think, no sitting MPs will be disturbed. The parties should give the seat to sitting MPs," said Muniyappa. Similarly, the JD(S) may ask for Tumakuru as it has won three MLA seats out of eight in the last Assembly elections. "We are making efforts to get tickets for the JD(S). Since this will be a coalition vs BJP, whoever gets the ticket from the JD(S) or the Congress, that candidate will win. At present, Congress has won only one MLA seat and BJP has 4. The JD(S) has got an overall lead of 1.46 lakh votes from Tumakuru. Hence we are asking for the ticket. From Congress, Muddahanume Gowda, the sitting MP is also lobbying," said Belli Lokesh, Tumakuru JD(S) leader. "We are a respectable party and cannot bow down simply. We will keep our foot down and demand our right," said Sharavana. BJP, which is a principal opposition, said this flexing of muscle by the JD(S) will add more trouble for coalition as dissident activity will come into play before elections and BJP will tap it to the fullest. "The Congress is at the mercy of the JD(S), it is not Congress that will pick its candidate, it seems like JD(S) is screening. Right from giving portfolios for Congress MLAs and now giving the seat to the Congress, JD(S) is having the last laugh. Congress candidates will get frustrated," said S Prakash, BJP spokesperson.